SINGAPORE - Singapore parents spend an average of S$21,000 a year on their child's university education, more than twice the global average, with over half willing to go into debt to pay for it. More than half say funding their children's education is even more important than paying their bills or saving for retirement. And while over a quarter of parents here expect their children to contribute to or pay back some of the money they forked out to send them to university, just 5 per cent actually do. These are the latest findings of a Value of Education survey series by global bank HSBC which asked more than 6,200 parents across 15 countries and territories about their ambitions and concerns regarding their children's education. About 395 parents participated from Singapore. "Singaporeans are placing their children's education at the top of their financial pyramid, often at the expense of other financial commitments and ambitions," concluded the HSBC report released on Thursday (June 9). The survey found that 52 per cent of parents in Singapore are willing to go into debt to fund their child's university or college education. But Singapore parents are not alone in this regard. The HSBC survey also reveals that more parents in other Asian countries and Mexico are willing to make that financial sacrifice. 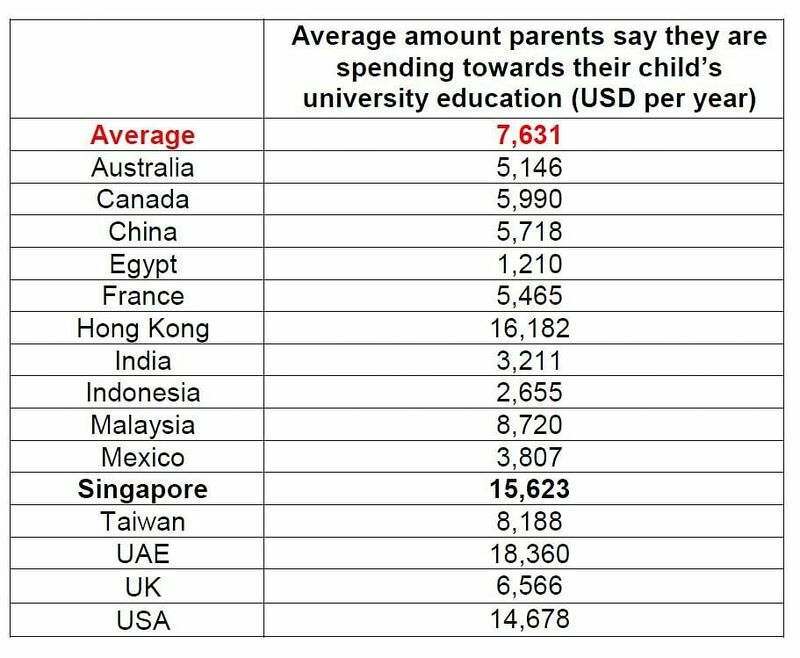 In China, 81 per cent of parents would go into debt to send their child to university, followed by 74 per cent in Mexico, 71 per cent in India, and 67 per cent in Hong Kong. Parents in the United Kingdom (43 per cent), Australia (44 per cent) and France (46 per cent) are the least likely to be willing to go into debt. The survey also found that 55 per cent of Singapore parents - compared to the global average of 49 per cent - say that funding their children's education is more important than saving for their own retirement, and 38 per cent prioritise it over paying their mortgage or rent - compared to the global average of 30 per cent. But Singapore parents' ambitions for their children go beyond higher education. Over three-quarters of parents surveyed in Singapore (77 per cent) have a particular career path in mind for their child, with medicine (14 per cent), finance (10 per cent) and engineering (8 per cent) being the preferred vocations. Said Mr Matthew Colebrook, head of retail banking and wealth management, HSBC Bank (Singapore): "What is striking from our report is how much Singaporeans see education as an enabler for their children's future professional success, and that they will prioritise it above all other family expenses and also their own retirement savings." Almost all Singapore students heading for university are relying on the bank of mum and dad - 95 per cent of parents surveyed say they foot some of the cost. But while over a quarter (27 per cent) of parents surveyed in Singapore expect their children will shoulder some of the cost of their own university education, only 5 per cent of their children actually do. Said Mr Colebrook: "Singaporean parents are predominantly the financial providers for their children's education and while many have expected this eventuality by putting away some savings ahead of time, most still rely on their current income to meet the costs." According to HSBC's report, 71 per cent of Singapore parents are funding their child's education using their day-to-day income (less compared to the global average of 78 per cent) and 49 per cent have additional funds to supplement their income, either from savings, investments or insurance (more compared to the global average of 34 per cent). "Having a proper financial plan in advance means that 'all boats can float' when it comes to managing household finances," said Mr Colebrook. HSBC's survey covered parents in Australia, Canada, China, Egypt, France, Hong Kong, India, Indonesia, Malaysia, Mexico, Singapore, Taiwan, United Arab Emirates, UK and US.